By Dale Johnson Posted: February 15, 2017 3:15 p.m.
About three-quarters of people say they have been affected by bullying – and school students turned out at the University of Regina to hear how they can stop bullying. 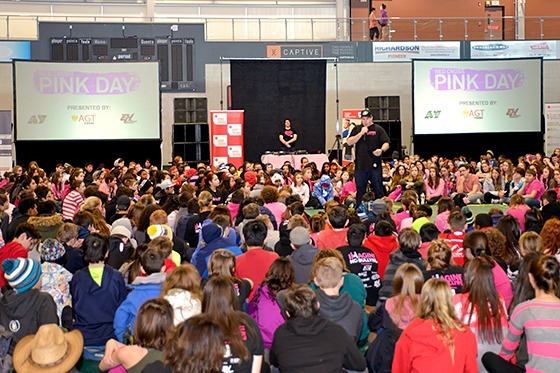 About 1,500 students from 30 schools in Regina attended the event at the U of R gym. The event was also live-streamed to hundreds of more students in Saskatoon and Prince Albert. Among the speakers at this year's event were U of R President Vianne Timmons and Dan Clark of the Sasktchewan Roughriders. 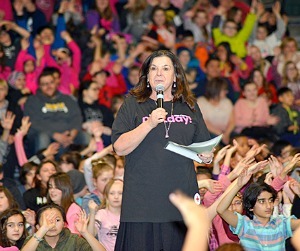 Timmons told the students they can be part of the solution by doing something to prevent or stop bullying. She says if you witness bullying and do nothing, you are empowering the bully. Clark shared his story of being bullied when he was going to elementary school. The rally was held in advance of the nationally designated day which is February 22, 2017. The Red Cross Day of Pink originated in 2007, when two high school students in Nova Scotia spoke out against bullying. After Travis Price and David Sheppard heard a grade nine classmate had been bullied for wearing a pink shirt, they asked their friends to wear pink to school. As the U of R Strategic Plan peyak aski kikawinaw outlines, hosting events such as the Red Cross Day of Pink demonstrates our commitment to our communities – where the University of Regina is a respectful and safe environment for all students, faculty, staff and other members of the public.